I hope you guys are all enjoying your summers! My summer is coming quickly to an end. I have to report to work on August 7th, and I will have students in my classroom on August 8th. Seeing as tomorrow marks the end of July, I do not have long. I'm excited to go back. I've been missing my students. One of the perks of working in a small school is that I will still get to interact regularly with my students even if I they aren't in my math class this year. The other math teacher's classroom is right across the hall from mine, so I will still see them every day. I can't wait to see their faces when they realize how much algebra they are going to get to use in geometry! Now, what I haven't done a lot of (or any of) this summer is lesson plans. So, the next week is going to be spent mapping out, in detail, at least the first full unit for each of my three preps - Algebra 1, Algebra 2, and (AP?) Statistics. This summer, I've focused a lot on learning. 16 days of my summer have been spent at conferences. I've learned a ton about the Common Core State Standards, teaching Pre-AP Math, teaching AP Statistics, and just teaching in general. In a way, it's kind of been information overload. I've learned about using Socrative, Edmodo, Fathom, and TI-Nspire calculators in my classroom. I've learned about how to teach math using M&M's, Barbie Dolls, Tennis Balls, Racquet Balls, Fruit Loops, Nerf Guns, pieces of rope, and other everyday items. I haven't found the time to process most of this new information this summer via my blog, and I regret that. A lot of my blogging is for me. If I don't blog about something, odds are I will forget about it. I am still amazed today that others find my ramblings useful. With one year of teaching under my belt, I don't feel like I'm anywhere near having this teaching thing figured out. And, I'm not sure I will ever get it figured out. There will always be more to learn, and I don't think I would have it any other way. Over the past few months, I've found lots of questions in my inbox regarding interactive notebooks. Actually, I think searching for information on interactive notebooks is the way most people find my blog. And, you can thank @druinok for that. She kinda made me promise to post lots of pictures of my interactive notebook pages. I am going to use interactive notebooks this year and really love what you've done, but I teach geometry, so I was wondering if you knew anyone, or worked with anyone who has a blog, with as much material and ideas, but in regards to geometry..
Off the top of my head, I would recommend checking out a blog called Journal Wizard for geometry interactive notebook resources. I've seen SO MANY amazing geometry ideas there lately. You also might want to check out Everybody is a Genius for other interactive notebook resources! I've tried to collect all of my Geometry findings on this pinterest board in case I ever find myself teaching Geometry. From my pins, it looks like there are quite a few blogs that may feature some Geometry foldables and activities. I have been reading it for the past couple of weeks getting ideas for INB's. I'm super excited about using them in my Algebra 2 classes next year and I'm trying to get a head start on planning. One composition notebook was enough for both my Algebra 1 and Algebra 2 classes. I think the number of notebooks needed depends on exactly what you put in the notebook. I only have my students put notes in their notebook. Other teachers have them do their bellwork and homework in the notebook as well. That takes up a lot more pages. I can see benefits to that approach, but I prefer to reserve our notebook pages for notes. My students know that if something is going in our notebook, it must be important. They have a tendency to remember exactly where they have written everything in their notebook, and they can flip to the needed information in just a few seconds. I have recently been encouraged to do interactive notebooks with my students but I'm not sure how they work and where to start. Do you have any helpful advice for me? I am very interested from your slope posts as to how helpful this would be for my students! I would start off by determining what the most important things you want your students to learn from your math course are. Can you turn this information into a graphic organizer or foldable? Or, can you give the information to your students in note form and have them transform it into a drawing, flow chart, or other sort of representation? With my Algebra students, I try to have them create one interactive notebook page per lesson. Some lessons are finished in a day and some span a week. I have seen other teachers who have their students create notebook pages every day. Others might only do a page or two per chapter. Megan Hayes-Golding has created a sort of interactive notebook home page that contains links to lots of informative posts on interactive notebooks. I think this would be a great starting place. When I decided to implement notebooks last summer, the best thing I did was to set down with my textbook and a old, partially used composition notebook. Without really knowing what I was doing, I just started creating pages. There is a definite learning curve, and a lot of the pages I did with my students looked nothing like those first drafts of pages I created during the summer. There are tons of ideas on the internet, and I can't tell you how many pages have been either stolen from or inspired by things I found on the internet. Do you have any suggestions for school supplies that the students will need to bring with them? The only supplies that I required my students to bring last year were a composition notebook and something to write with. I provided my students with colored pencils, scissors, glue sticks, markers, tape, notebook paper, graph paper, calculators, rulers, and anything else they needed. One of the reasons I provide so many of my students' supplies is that I teach in a high poverty area. In many schools, these items would probably be provided by the students. Love your math notebooks. Which do you prefer, composition books or binders? I have done the Notebooks for science and social studies both ways but this year I'm doing one for math also. I prefer for my students to use composition notebooks. I find that my students are more likely to keep up with a composition notebook than a binder and less likely to steal paper from it for other classes since it is bound. I had several students last year who did use a binder, and that was perfectly fine. I let them choose whatever worked best for them. I also had one class of students that used spiral notebooks instead of the composition notebook. If your students are already used to carrying a binder, that may be the way to go. That isn't the case in my school. And, I have many students who end up leaving their notebooks in my classroom. The notebooks take up much less space than binders would. I guess there are tons of variables to consider! Did you give your students written instructions on how to set up the interactive notebook? If so, could you post it? I didn't give my students written instructions to set up their notebooks. At the beginning of the school year, I would model how I wanted something done and then give them time to complete it in class. We spent one entire class period creating our cover page, gluing in the syllabus, and making the table of contents. I did include some limited information about their interactive notebooks in the syllabus. Composition notebooks are great. The pages are bound and cannot be easily torn out. Spiral notebooks provide more space to write, but their pages can be torn out much more easily. I had several students move in from another teacher's class that ended up using spiral notebooks. I think either can work great. I pre-print the notes and have my students glue them in their notebooks. We use glue sticks, but many other teachers prefer to use scotch tape. I invested in several dozen of those gigantic glue sticks, and they seemed to work quite well. I'll be honest. It's time consuming. I'm pretty sure that my students are the slowest cutters and gluers in the world. But, my students use their notebooks all the time, so it's a price I'm willing to pay. I spent a lot of time preparing stuff for the interactive notebooks last year. I worked late many nights, but it was also my first year of teaching. So, I would have probably been working late whether I was doing interactive notebooks or not. As the year went on, my students became faster at putting things in their notebook, and I became faster at creating notebook pages. I can't imagine having six preps, and I applaud you for that. I have three preps, but I only used the notebooks with two of those preps. My other class got really jealous, though, when they found out that the other classes got to do "arts and crafts." My students were not used to interactive notebooks. This was a new experience for all of us. I did have a student move in part of the way through the year, and he brought his interactive notebook from his old school with him. It was pretty cool! Last year, I knew that I wanted to make sure that I had a way to ensure that I preserved the classroom memories that are easily forgotten. These are the funny things that students say or the lessons that go extremely well or the compliments that are passed on. I kept a glass jar on my desk last year, and I tried to remember to write down these memories on individual post-it notes. I folded them up, and I told myself that I would sit down at the end of the year and read them all. Of course, my students were extremely curious about the jar. When I told them my plan, they somehow assumed that this meant I was going to read the notes to them at the end of the year. Much to their disappointment, I didn't. In retrospect, I think I should have pulled out all the ones I wanted to keep private and then shared the rest with my students. Next year, that will be my plan. 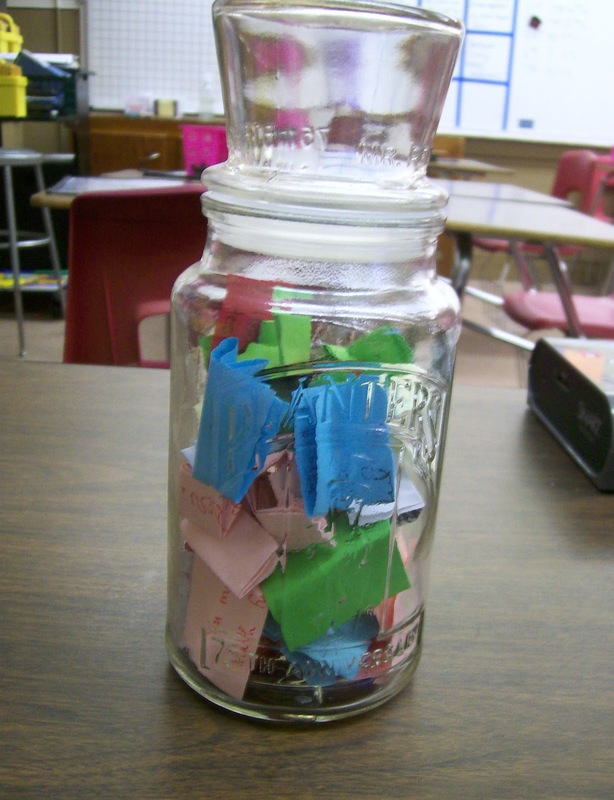 A couple of weeks ago when I started decorating my classroom for the upcoming school year, I saw the jar on my desk and realized that I had never sat down and read the notes. As I opened and read each note, I couldn't help but smile. Reading these reminded me just how fun teaching is. Working with teenagers can be frustrating and stressful, but they are also just funny. My students are very honest and candid which can lead to hurt feelings. But, it also means that their compliments and comments carry great weight. I love my students, and I can't imagine a better job. After opening and reading all the notes, I knew I wanted to keep them, but I was unsure how to go about that. While reading my favorite memories to my younger sister, she suggested that I could laminate the post-it notes to. So, I pulled out my trusty laminator, a single hole-punch, and a binder ring. And, I used these to create a book of memories. This is the perfect size to tuck in my desk drawer for those days when things just don't seem to be going right. I can pull out these memories and remember all the good days. I want this to become a yearly tradition. Knowing that I'll be keeping these forever, next year I pledge to use better handwriting. Most of these memories were jotted down quite hastily, and it shows. Also, I want to do a better job of keeping up with my memory jar next year. Last year, I wrote a bunch at the beginning of the year, and it kind of tapered off as the year progressed. My neighbor coming to school and trying to give me a couch. Hearing a parent at an IEP meeting say "You're the first teacher EVER that I have heard [my daughter] say that she likes." Getting called Mom for the first time. Snowball fights to practice solving equations. "Wow. It looks like you could really learn in here." - A student up on seeing my classroom for the first time. "You're not my favorite teacher, but you are my best teacher." "What is a quadratic?" "It's what happens at an aquarium when the fishies die." Celebrating Universal Letter Writing Week with my students. The best part was seeing the reactions of the teachers and staff members who received the letters. "I asked for a dreidel for Christmas." "You can't call it a hamburger fold because you don't eat hamburgers." "Am I the only person who makes the bellies of my fives really fat?" "Are fish sticks really fish?" "It's weird seeing teachers in public. They shouldn't have a life outside of school." "I don't think Slope Dude has any friends." "I'm gonna name my kid 'Parabola.'" "If you don't teach here next year, I'll cry." "I'm gonna name my kid 'Perpendicular.'" Well, I've decided to change my mindset when it comes to my Made 4 Math Monday projects. Usually, I start thinking about them on Monday and don't get them finished until later in the week. I always feel bad because I'm naturally a very punctual person. I hate, hate, hate to get anywhere late. I was that student in college who felt like they were late if they got to class with only ten minutes to spare. I love getting places early. I'm the type of person who looks up on Google Maps how long it will take to get somewhere and then still leave thirty minutes or an hour early JUST IN CASE. So, instead of feeling bad about being late for this week's Made 4 Math Monday post, I've decided that, instead, I'm just extremely early for next week's Made 4 Math Monday post. The left (negative) side of my number line. And, if you already have a number line in your classroom, this website also features a printable pi strip that you can print that features up to the first 1000 decimal places of pi! There is also a printable vertical thermometer scale that could possibly be utilized as a vertical number line if that is of interest to anybody. Actually, I'd just recommend that you spend a few minutes checking out the numerous files that are available to download! If you find anything interesting or useful, leave a comment or (even better) write a blog post to share it with the world! A view of (almost) the entire number line. I hung my number line using sticky tack above the map railing that is above my dry erase board. I really like how it turned out. The numbers are large and easy to read from across the room. I hope this will be a resource that my students will reference all year long. If you are interested in the posters hanging on my map railing, they were downloaded from the North Carolina Council of Teachers of Mathematics website. Last year, I used these posters to create a math-themed bulletin board in the back of my classroom. This year, I have different plans for that bulletin board, but I still wanted to feature these posters in my classroom. Made 4 Math: Flip Chutes! 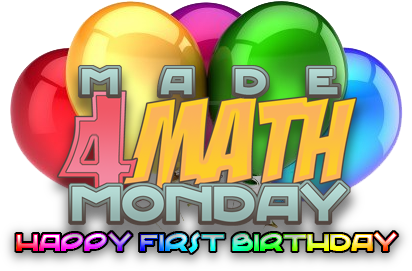 I want to wish a happy belated first birthday to Made 4 Math Mondays. (Yes, I realize it is now Thursday.) Most of my Made 4 Math Monday submissions were not actually submitted on Mondays, so I guess it's fitting that I am celebrating this first anniversary with a late submission as well. I was first introduced to flip chutes via Pinterest. I saw them and thought they were cute, but I dismissed the idea as being too elementary for my high school students. With one year of teaching experience under my belt, I've learned that nothing is too elementary for my high school students. They love stickers and cheesy awards. They enjoy (for the most part) cutting, glueing, coloring, and folding. They may make fun of the silly math songs I have them listen to, but I hear them singing them for the rest of the year. Earlier this summer, I attended my first OCTM (Oklahoma Council of Teachers of Mathematics) Annual Summer Conference. I had a blast, and I left feeling inspired. The first session I attended was Making High School Math Fun, and it did not disappoint! The session was led by Tracy Slate. (Tracy is a Regional T3 Trainer, and she has posted some of her resources on her website.) She showed us a lot of hands-on review activities that she did with her students. One of these was a flip chute. She passed the flip chute around the room, and we all had to try it out. The premise is simple. Put the flashcard in the top slot. The card will travel through the chute and exit through the bottom slot. The card will land on the table with the answer facing upward. Words cannot really express how fun this is. It's the type of thing that you just have to experience to understand. Yes, you could just flip the flashcard over to get the answer. But, believe me, this way is a whole lot more fun. I enjoy it, and I think my students are really going to enjoy it, too. I made two of these for my classroom, and I look forward to having these as an option for students to use. I can see my students using these to practice integer operations, vocabulary, important formulas, parts of an expression, etc. Instructions and templates are available online to create your own flip chute. I used this handy pdf that I found online that included everything you could ever need to know. You're supposed to make these out of empty milk or orange juice cartons. I didn't have any of these cartons at my house, so I ended up improvising with saltine cracker boxes. My dad was kind enough to spray paint my boxes for me. I've only spray painted one thing in my life, and it turned out terribly. Because I used a wider box than the template called for, I had to cut some Styrofoam to fit in the sides. Otherwise, the cards will turn sideways and get stuck instead of flying out the chute. I actually wrote this in response to the Week 1 topic of Walk the Plank Wednesdays. I'm so excited about what I wrote that I decided to break my unintended blog hiatus with this post. I actually have yet to read Teach Like A Pirate. I'm hoping to get to it this weekend. Most of my reading of late has been either Embedded Formative Assessment (amazing!) or non-school related reading. Until I went to a Pre-AP Math Conference last week, I had no idea why it was customary to rationalize the denominator of a fraction. I never questioned the practice when I learned it in school. Last year, I simply taught my students that “mathematicians don’t like to have radicals in the denominator.” They complained and weren’t quite satisfied with that explanation. Next year, I will introduce the concept of rationalizing the denominator by taking away my students’ calculators and providing them with square root charts like those found in old math textbooks. I will ask them to find the numerical approximation of 1/sqrt(2). After suffering through having to divide 1 by 1.414, I hope they will ask for a better way. Then, we can talk about how a fraction remains equivalent as long as the numerator and denominator are multiplied by the same value. I will ask students what they think we should multiply the numerator and denominator by. Hopefully, someone will suggest that we multiply the numerator and denominator by sqrt(2). (Of course, I’m going to make my students try out all the other possibilities that are suggested, too. They are going to absolutely love me!) Then, we will use our chart to divide sqrt(2) by 2 or 1.414 by 2. This division problem is much, much nicer. Most students should be able to do this in their heads. I can see myself bringing out the stopwatches and breaking the class into two groups. I will put an expression on the board that involves a radical in the denominator. The goal is to find the numerical approximation of the value. One group will solve the problem using the square root chart without rationalizing the denominator. The other group will solve the problem using the square root chart with rationalizing the denominator. What is the time difference? If you had a homework sheet of 20 problems, how much time would you save by rationalizing the denominator? I want my students to see that rationalizing the denominator does have a purpose. Or, it did have a purpose in the days before calculators. Yes, in this current day of technology, we just type 1/sqrt(2) into our calculator and let it do the work for us. Hopefully, seeing the historical reason behind the mathematical process will help my students understand why we rationalize the denominator and the process will be more meaningful to them. With Common Core and the increased emphasis on writing, I'm always on the lookout for creative ways to fit more meaningful writing into my math lessons. Oklahoma's current Algebra 1 EOI features specific questions on rationalizing the denominator. I think I will have students write a memo/letter/speech/etc to the State Department of Education expressing their toughts on whether students should or should not still be required to rationalize the denominator in light of technological gains. I need to look into the Common Core Language Arts standards and pose this question in such a way that it matches what students will be required to write on their end of year test.